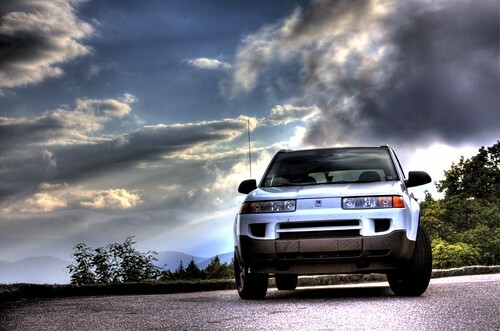 The Saturn Vue is a compact crossover SUV which was sold from 2001 through 2009. The original Vue’s platform is shared with other GM vehicles including the Chevrolet Equinox, Pontiac Torrent and the Opel Antara, which is only available in Europe. Despite its rather low price compared to its competition, the Vue came standard with many features including OnStar, automatic headlights and cruise control. The Vue sold well right up until the end, when GM dissolved the whole Saturn brand during its 2009 reorganization after declaring bankruptcy. The first generation Vue had four engine options, including a four cylinder engine complete with a continuously variable transmission. However, this transmission had many problems and was cancelled in 2005. In 2004, the Vue Red Line was release. The Red Line package was a performance package that uses a Honda engine and transmission combination. This sporty package also had stiffer suspension, one inch lower ride height, and a redesigned steering system for better performance. Exterior additions included larger, 18 inch wheels, unique trim pieces and a chrome exhaust tip. The interior was much the same as normal models, but the Red Line package did include unique leather seats. In 2007, which was the final year of the first generation, Saturn introduced yet another trim package for the Vue; the Green Line. This was an environmentally oriented package, contrasting the Red Line, which in contrast was all about performance. The Green Line model was a hybrid which featured an electric motor that was connected to the gasoline powered engine. This system allowed for the motor to be turned off when the car stops, which saves gas and wear and tear on the engine. A battery pack connected to the braking system also provided regenerative braking. These features allowed the Vue Green Line to achieve 20 percent better fuel economy than the standard model. In fact, the 2007 model had the highest highway fuel economy of any SUV sold in the United States for that model year, an impressive feat. The second generation Saturn Vue was introduced in 2008 and was changed dramatically. No longer was the Vue based on other GM vehicles. Instead it was a re-badged Opel Antara which was manufactured in Mexico. Like the first generation, Saturn offered it with four different trim levels. The base trim level was “XE” with one step up being designated as “XR.” The Red Line and Green Line packages from the first generation also made their way over to the second generation. The Red Line’s 3.6 liter V-6 engine was very sporty for a small SUV, allowing the Vue to have one of the best 0-60 mph times in class. The second generation was only sold for three model years before Saturn was shut down, though Chevrolet continued to sell the Vue in other countries as the Chevrolet Captiva Sport. In 2012, the Captiva Sport will be available to purchase in the United States for the first time, but will only be sold as a fleet vehicle. Saturn produced great vehicles with excelent technology and sporty wheel covers on their vehicles.